ភព (អង់គ្លេស ៖ planet) គឺជាវត្ថុដ៏ធំដូចភពព្រហស្បតិ៍ឬ ភពផែនដីដែលមានគន្លងគោចរវិលជុំវិញដួងតារា (ផ្កាយ) មានទំហំតូចជាងផ្កាយ តែមិនបញ្ចេញពន្លឺទេ មានរាងវិស័យដូចបាល់។ Objects that orbit planets are called moons. សូរ្យព័ន្ធចក្រមានភពចំនួនប្រាំបីអង្គ. Pluto used to be known as a planet, but in August 2006, the International Astronomical Union decided it was a dwarf planet instead. There are four more known dwarf planets, Ceres, Makemake, Eris and Haumea. Until the 1990s, people only knew of those in the Solar System. As of June 2011, we know of 563 other planets. All of these newly found planets are orbiting other stars: they are extrasolar planets. Sometimes people call them "exoplanets". 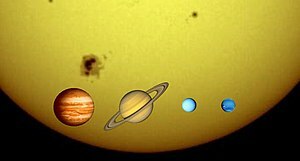 Planets from the solar system. The planets in the Solar System have names of Greek or Roman gods, apart from Earth, because people did not think Earth was a planet in old times. However, Earth is occasionally referred by the name of a Roman god: Terra. Other languages, for example Chinese, use different names. Moons also have names of gods and people from classical mythology, or from the plays of Shakespeare. Here is a list of planets in our Solar System. They are ordered by how close they are to the Sun, nearest first. Jovian or gas giant: These planets are mostly made of gas: Jupiter, Saturn, Uranus, Neptune. Uranian planets are a special sort of gas giants, they have less hydrogen and helium.